Attention trade professionals, business owners, contractors, and their clients in Colorado Springs: kitchen remodeling has never been easier than it is today. Thanks to ProSource® of Colorado Springs, trade professionals and their homeowner clients have a comprehensive way to find all of the right products at the right prices in one convenient location. Our vast Colorado Springs showroom is filled with the best brand names, products, and prices, along with an attentive customer support staff to guide you through the process. Where else but ProSource of Colorado Springs can you find wholesale kitchen cabinets from the leading brand names at the most affordable prices? Nowhere, that’s where. 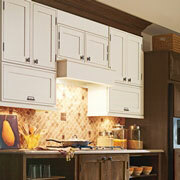 ProSource features exclusive styles, designs, and colors from some of the most trusted names in kitchen cabinet craftsmanship. 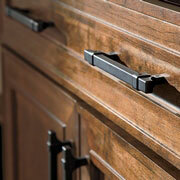 Cabinet hardware is to the cabinet like the perfect piece of jewelry is to an outfit. It accessorizes and embellishes an already beautiful piece. From simple handles to vintage knobs, ProSource features pieces of hardware that help tie the kitchen together through the details. 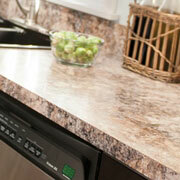 A major piece of a kitchen remodel project, the countertops are both functional and beautiful. The classic looks of granite and quartz are hard to beat, that is unless your client is interested in eco-friendly and recycled materials. ProSource works diligently to make sure countertops are properly measured and cut to make the next steps of your project even easier. 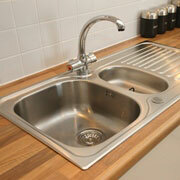 The kitchen sink is usually a focal point of the kitchen since it is used multiple times throughout the day. From apron-front to triple basins to the traditional double basin, Prosource has a seemingly endless collection of sink sizes, styles, and finishes in stock. 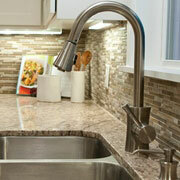 The kitchen sink is incomplete without the right faucet. The faucet helps the sink function to its fullest potential. Whether it’s a traditional kitchen faucet with a spray nozzle or an additional faucet to make it easier to fill pots, there is a faucet for everyone at ProSource. Our collection includes an impressive selection of colors, forms, and functions.